I have seen other places like Sipadan 45 years ago. Now we have found again an untouched piece of art. A major attraction are it’s resident Green Turtles, scientifically known as Chelonia mydas. 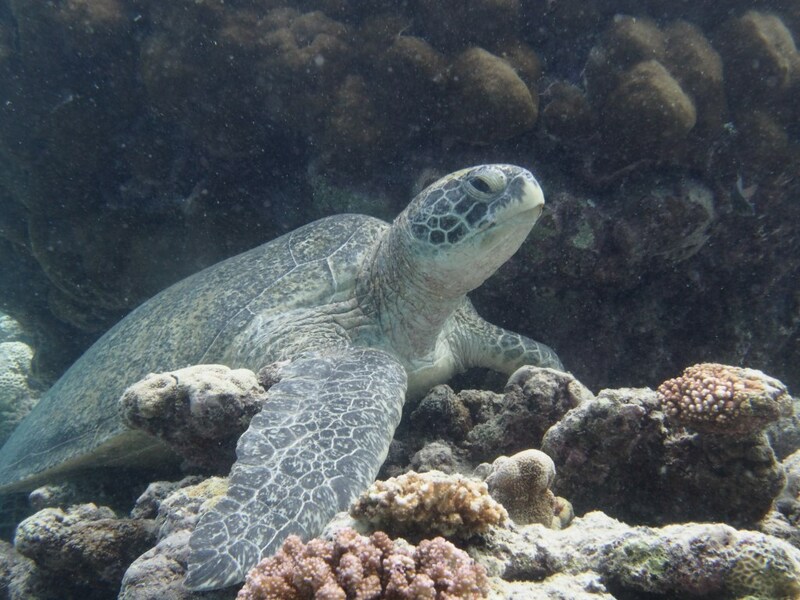 Although Green Turtles are endangered, it is not uncommon to see one or two dozen turtles during a single dive! In fact, Green Turtles are so plentiful here that researchers often come to study the turtles that nest year-round on the island. In December and July, nesting activity peaks providing an ideal opportunity to witness this magical occurrence. Green Turtles are among the largest species of sea turtle weighing up to 320 kgs and reaching a length of 1.5 m. Named for the color of their skin, the shell of the Green Turtle is typically brown or olive in color. Green Turtles are the only species of herbivorous sea turtle and are often found in the seagrass meadows of Sipadan during high tide. 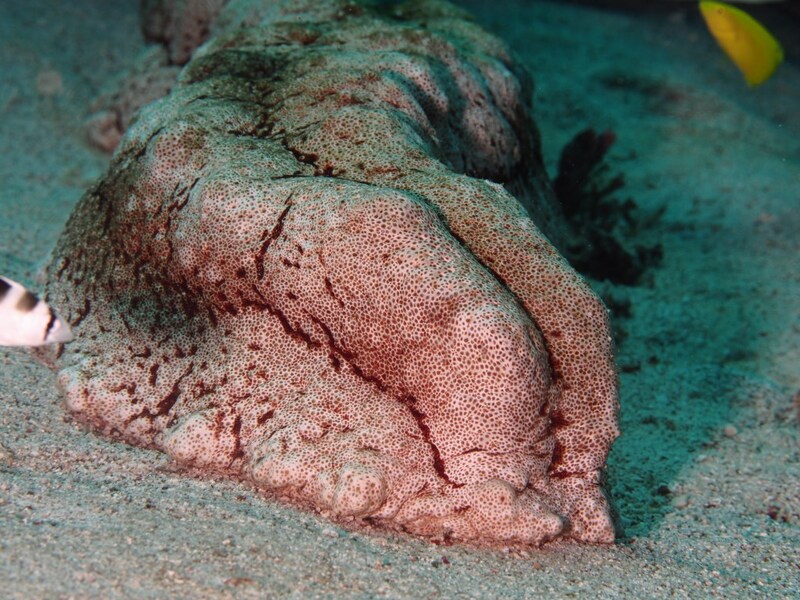 Thelenota anax – Also known as the Giant Sea Cucumber, this rare species prefers hard ground, large rubble, and coral sand patches typically at 10-30 m depth. As their name may suggest, this species can reach up to 61 cm and is so large that it is known to host various crab and snail species living on it’s abrasive skin. Their skin varies from grey to yellowish grey and is covered in irregular patches of tan and red. Around Sipadan, Thelenota anax has only been observed in the sand and rubble plain at Barracuda Point. Thelenota anax is increasingly targeted by fishers as other stocks decrease. Thelenota anax at Kapalai House Reef. We are kicking ourselves for not realizing the significance of this species, and only photographed half of the sea cucumber. Actinopyga albonigra – Typically found in shallow waters, Actinopyga albonigra’s occurrence in Sipadan is a new record for the region. Actinopyga albonigra has pale skin covered in black to brown blotches, which many divers endearingly compare to dalmation sausages. Like all sea cucumbers, these species are ecologically important for their role in cleaning sand. Glossodoris stellatus – The chromodorid Glossodoris stellatus is one of several rare species of nudibranch found at Sipadan. Its dark brown or black body is covered from head to…uh, tip, in teeny-tiny white speckles. It’s name stellatus is latin for ”starry” which suits this milky-way reminiscent nudi. The body of Glossodoris stellatus is also adorn with 12 pinnate brightly colored brachial plumes, or “naked gills.” Observing this species is extremely fortunate, as the only other published record of its occurrence is from Papua New Guinea, where Glossodoris stellatus was first discovered. 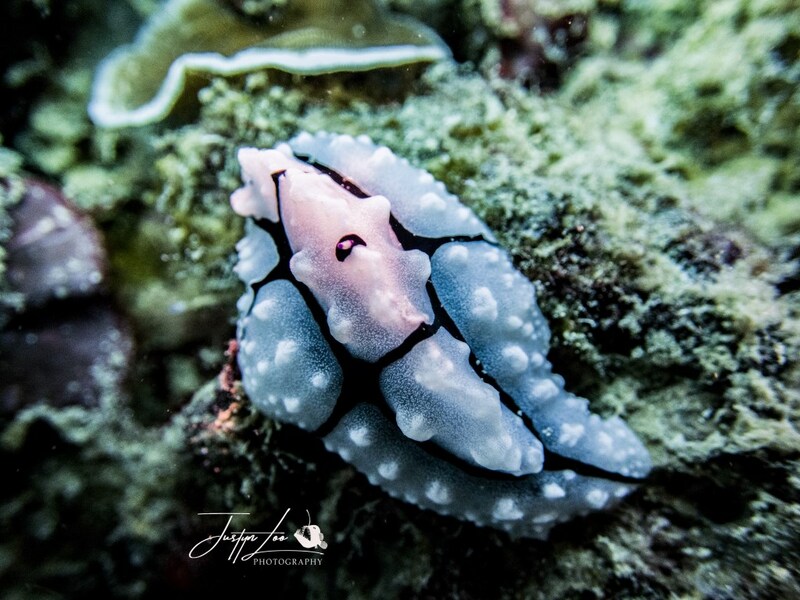 Phyllidiopsis krempfi – Phyllidiopsis krempfi is one of the larger species of sea slug dorid nudibranchs. This species is typically pink in color and with two large longitudinal lines running down the length of its body. Several smaller, parallel lines are present along with white tubercles, which almost look like teeny-tiny popped popcorn kernels. To determine which side is the animal’s head, look for the black antena-like protrusions, called rhinophores. Phyllidia babai – Phyllidia babai is distinguished by a cream to light yellow body covered in white tubercles in the center of black rings. The mantle, or underside, is edged in bright yellow. 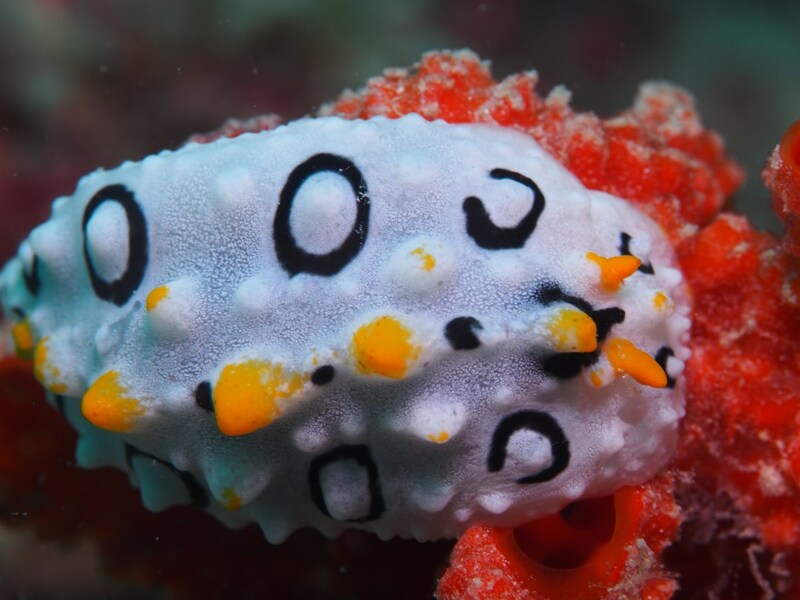 Keep a watchful eye for the evasive Phyllidia babai, as it is one of the rarest of the six species of nudibranchs belonging to the family Phyllidiidae. 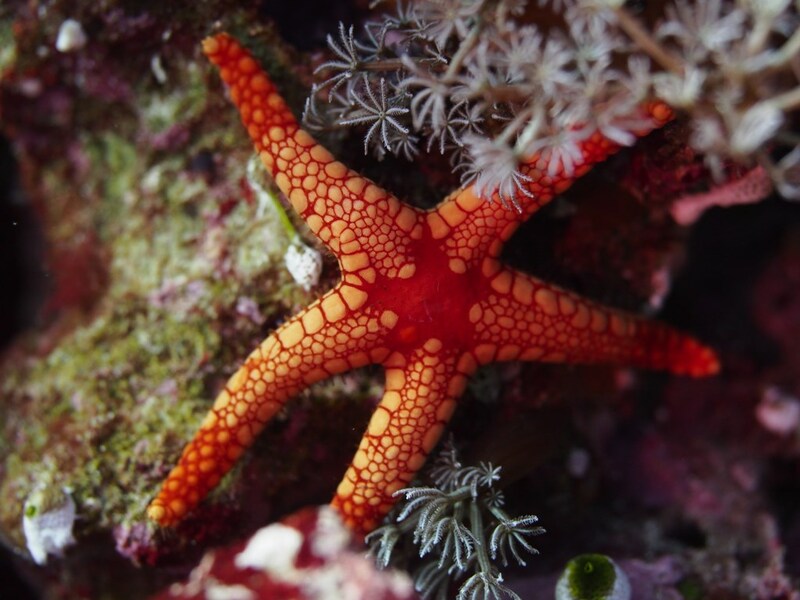 Thromidia catalai – Weighing it at a maximum of 6 kgs, Thromidia catalai is one of the largest known seastar species. 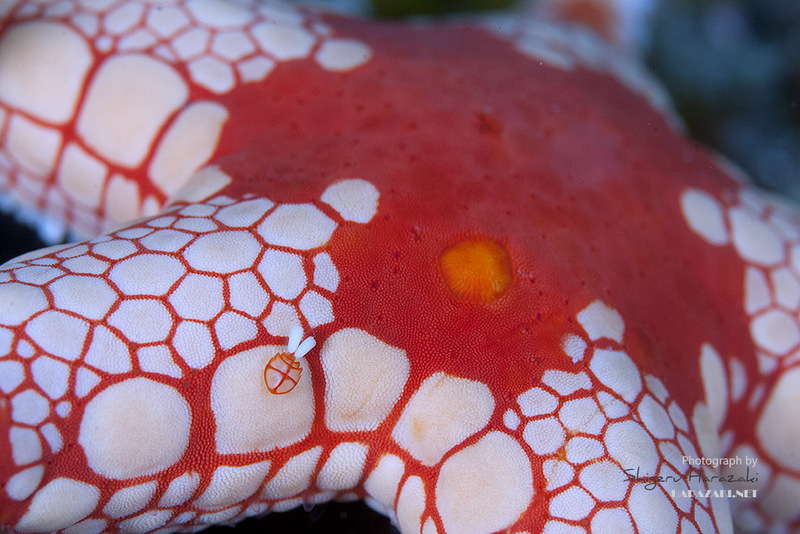 Often referred to as the Heavy Seastar, or Fat Seastar, Thromidia catalai ranges from white to yellow to orange and has brown tips. Thromidia catalai is rarely seen throughout its range in the Pacific and it’s occurrence here is the first confirmed record for the Indo-Malayan Archipelago. Celerina heffernani – Also known as Hefferman’s Starfish, Celerina heffernani is a find for underwater photographers, who flock to capture the microscopic symbiotic copepod, Sipadania celerina. Several of these rare species have been recorded at Sipadan which is notable, since only single records exist for most other Indo-Pacific localities where Celerina heffernani has been found. Sipadania celerina is a small parasitic copepod which takes its name from its host, the starfish Celerinae heffernani. 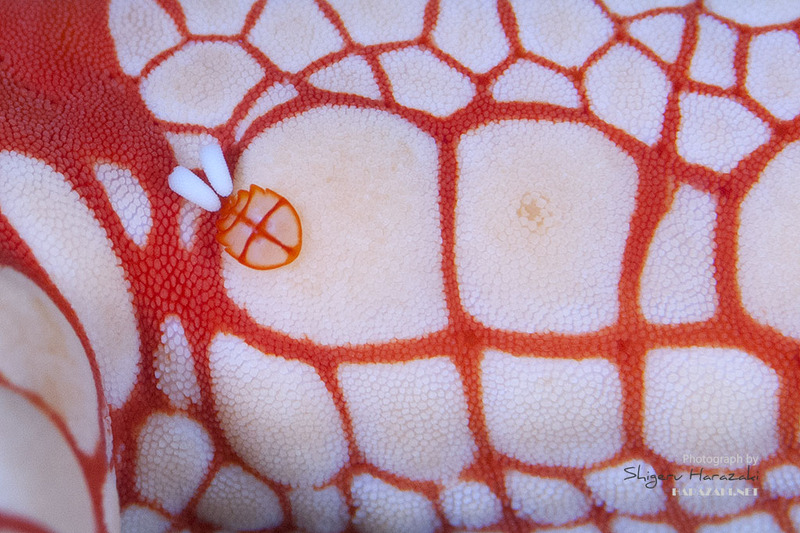 This small crustacean has a striking red cross on its body to help it camouflage against its host. 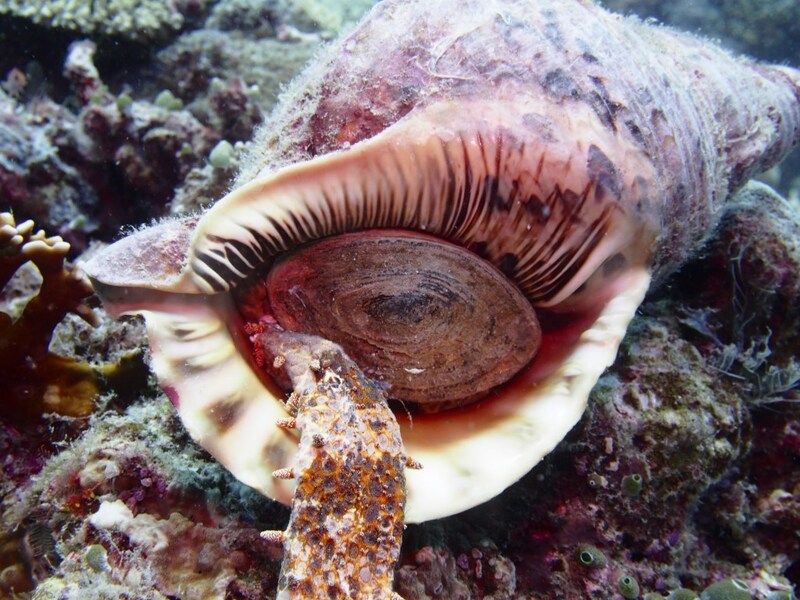 Charonia tritonis – These large marine snails are named after Triton, the son of the Greek God of the Sea, Poseidon. Triton’s Trumpet can grow up to half a meter in length and are known to actively hunt and kill sea stars, sawing through their though skin with their knife-like tongue. Triton’s trumpet are one of few predators of the Crown-of-Thorns Seastar (COTS) and are of great ecological importance in controlling COTS outbreaks. At least 80 distinctive macrosponges have been observed on Sipadan Island, but only 30 of these could be positively identified. Many of the unidentified organisms are likely new species, new records for the area, or rare species. 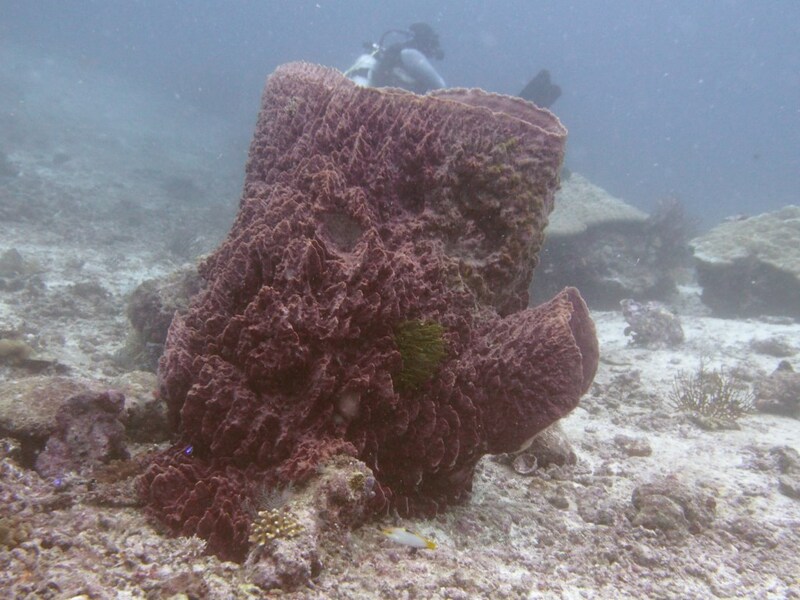 Furthermore, many sponges along Sipadan Island have been found to have natural antioxidant and antimicrobial properties, which may be used one day to replace the artificial drugs. We want to thank our friend Shigeru Harazaki for happily sharing with us images of the rarely seen and photographed Sipadania celerina species. He is a land guide on the world heritage Yakushima Island as well as a dive instructor. He loves animals and is affiliated with a number of marine and land animal societies based in Japan. He also has beautiful collection of images on his website. 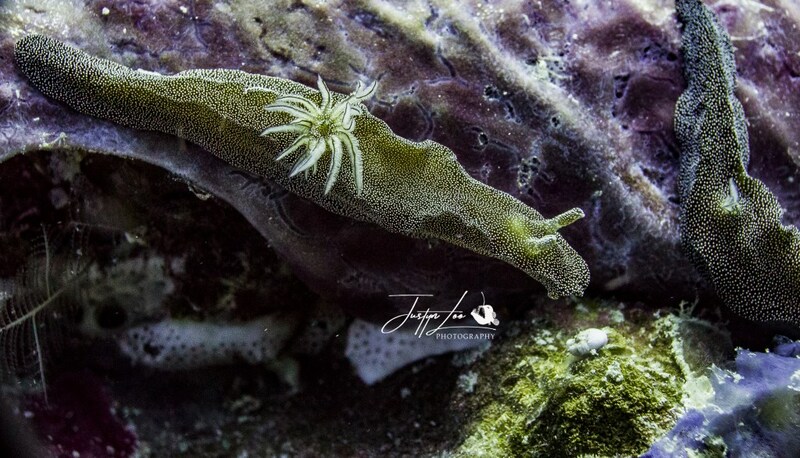 We want to thank our friend and dive buddy Justyn Loo for generously letting us use some of her images for this article. She is a freelance marine biologist and has a huge image collection of underwater macro life, from common species to rare ones.